More details have emerged about Microsoft Courier, Redmond's rumored tablet project. Gadget blog Gizmodo has uncovered a set of illustrations that make it clearer how you would operate the device, and what its mains functions would be. On paper, Courier looks like it would be an innovative device, with some killer features. Unlike Apple's rumored tablet, which is assumed to be primarily an entertainment device, Courier's main function will be as a day planner/notebook that allows you to keep track of appointments, to-do lists, and contacts. In addition, Courier is believed to have significant flexibility allowing you to create original drawings and sketches using an application like Microsoft Paint. 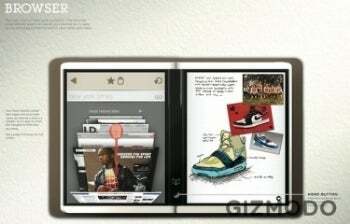 You will also be able to take notes, snap photos, browse the Web, and clip photos and text from Web pages. Courier may even function as an e-reader, although Microsoft CEO Steve Ballmer has said the company is not interested in producing an e-reader. 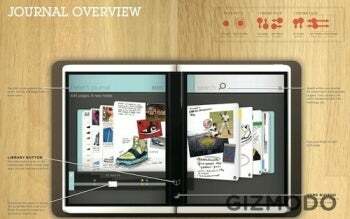 Based on what has already been reported, the rumored Courier tablet would have two 7-inch color screens, with a flexible hinge in the middle allowing the device to close like a book. The hinge would also have a home button, as well as indicators for wireless signal and battery strength. The two screens can accept handwriting from a stylus or multi-touch inputs from your fingers. Courier would not have any type of keyboard, and rely entirely on handwriting recognition for text input. Courier would also include Wi-Fi connectivity, and a camera on the back of the device. There's no word on whether Courier would include extras like a Webcam for video conferencing or 3G connectivity. At the core of Courier's functionality would be the Infinite Journal, which is exactly what it sounds like: limitless virtual pages where you can take notes, sketch, and store Web clippings. Gizmodo says the Infinite Journal would have page numbers for easier reference, and every page receives a timestamp and a location tag once content has been entered. It's not clear whether the Infinite Journal's location tag would come from automatic geotagging through GPS or wireless access points, or whether it's just a matter of manually entering your location for each page. You can also mark Infinite Journal pages with keyword tags to make it easier to search for content. The Smart Agenda would essentially be a condensed version of your Infinite Journal pulling together day-to-day information for easy reference including e-mails, to-do lists, appointments, and recent messages. Clicking on any of these items in the Smart Agenda would take you to the page where these items are stored in your Infinite Journal. Microsoft is all about the cloud these days, with company executives constantly referring to Microsoft's three-screen vision (personal computer, mobile device, and television all syncing or pulling information from an online database). Courier is no exception, as it offers a function that allows you to share portions of your journal with colleagues and friends online. When your content appears online, the people you share your journal with will be able to make notes and comments about your content. Once the comments have been entered, they are automatically updated on your Courier device so you can see what your collaborators are saying. One of the most interesting functions of Courier is its ability to clip content from a Web site and allow you to store and manipulate that information any way you like. Called Clip, Tuck, and Paste, with this function you would be able to clip information from a Web page, and then 'tuck' it underneath Courier's hinge between the two screens. Then, you can flip or search through your Infinite Journal until you find the page you want to store the content in, and then paste the Web clipping into your journal. The Courier's stylus would include easy methods to switch between writing, sketching, and painting as well as some clever editing functions. On the side of the pen would be two quick access buttons that let you switch between a writing pen and a marker. The second button would have an undo function to get rid of the most recent action in your journal. You can also twist the stylus to activate Courier's drawing functions, and the very top of the stylus would be a virtual eraser to get rid of any notes, annotations or drawings you've already made. According to the illustrations, there's a lot more to the Courier, including a Web browser, camera, a file browser called the Library for a quick look at all your stored information, easy-to-use painting tools and more. These new details about Courier make it sound like a fascinating and innovative device. However, we also don't know some basic things about Courier like how it would handle Web-based video or what kind of storage this device would have. I should also point out that so far we've only seen illustrations, and computer-generated videos of Courier in action. After several information leaks, and unnamed sources assuring the tech world that the device is real, no photographs have surfaced yet showing a physical Courier prototype. Although, there is a Network World post from September that shows off a live video of another Microsoft prototype called Codex that is strikingly similar to Courier. Maybe a physical Courier prototype is out there somewhere, but I'd sure like to see tangible proof before getting too excited about this device.